UK troops acted "humanely" overseeing the controversial 1947 disembarkation of 4,000 Jews against their will into Germany, newly-released papers show. The praise was given by Lt Col Gregson, who was in charge of the disembarkation at Hamburg, information in the National Archives' file say. The Jews - Holocaust survivors - were returned to Germany after the UK refused to allow them into Palestine. Lt Col Gregson banned media from the quayside during the disembarkation. "If one is an actor there is no point in putting on your show if there is no audience and the same applies to the immigrants," he wrote. "After disembarkation they are free to spread all the atrocity stories they like, whatever the disembarkation has been like, but if the press is there they have got to put on a show for them to see." 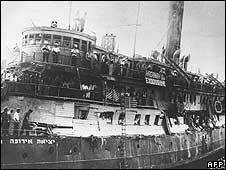 The immigrants were determined to get into Palestine, but were turned back to France, from where they had sailed on board the ship Exodus 1947. They were eventually sent to Germany, where they were put in camps in the north of the country. The National Archives documents reveal detailed accounts of British military commanders who oversaw the arrival of the ships containing the immigrants - the Ocean Vigour, the Empire Rival and the Runnymede Park - at Hamburg. One report from the military headquarters in Hamburg described the operation to remove the immigrants at Hamburg as "eminently satisfactory" in spite of negative press reports in Germany and the US. Passengers from the Empire Rival were described as appearing "cheerful and the children were looking undoubtedly well and fit". The Runnymede Park disembarkation had more problems - Lt Col Gregson described it as "quite a shattering battle". "In the unloading of the Runnymede Park, there was naturally a fair degree of force employed. "Fire hoses and batons were used on the side of the troops," said the report. "On the part of the emigrants, there was some use of broken bottles, tins were thrown and lumps of bully beef into which jagged pieces of tin had been stuck. "On the other hand, no firearms, knives or daggers were ever used on either side, nor was tear smoke employed." He blamed a "few young soldiers getting excited" for slight pushing on the docks. "No other troops could have done it as well and humanely as these British ones did," he said. However, Dr Noah Barou, secretary of the British Section of the World Jewish Congress, said the Runnymede Park disembarkation was a "very painful and heartbreaking picture". "The taking off of people by force is always a hard job, but I consider that the operation was organised from the operational military point very badly. "The soldiers used were very young," he said in an account in the files. "They went into operation as a football team with speed and resolution but it seemed evident that they had not had it explained that they were dealing with people who had suffered a lot and who are resisting in accordance with their convictions."